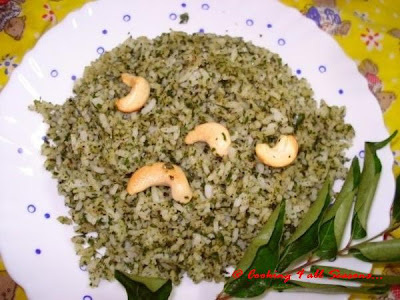 Cooking 4 all Seasons: Karivepaku Annam ~ Spiced Curry Leaf Rice! Karuveppilai sadam or Karepaaku Annam is our all time favorite rice. 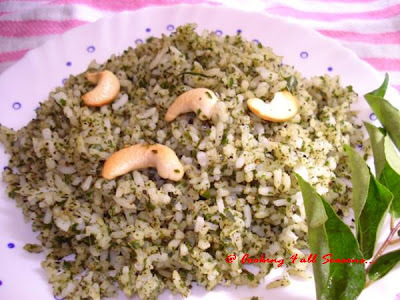 This rice can also be made with the Spiced Curry leaves Powder or in a very simpler way too. Curry leaves are so important to our Indian cooking. Most of our dals are incomplete without a curry leaf in it. That not being enough, we love the podis we make with these leaves. The Curry leaves are highly aromatic and are used as an herb. It is also highly valued for its medicinal usage. We mostly have a spiced powder ready at home and making it a mixed rice, makes it more attractive. Mix this in hot rice with ghee, garnished with nuts.You wouldn't want to have anything else next to this. The first time I remember asking the cook for this recipe, was during a wedding that we attended. It was a wedding of a very close family friend, Uncle B's Son and so he was trilled to get us the details. He called the cook to our table and made him tell us how he prepared. It was so simple that Amma was surprised that it actually tasted so yummy and different. I remember that occasion so vividly because we made the trip to Mysore just to attend the wedding. Uncle B was the most kindest and softest person I have ever met. During his service, he was reporting to Daddy and though he was much older in age, he was so subservient and humble. And he thought the world of my parents. I always admired his hospitality and kindness. We always enjoyed visiting him and his family, during our summer vacations. He was posted in Mysore and we must've visited Mysore some 5 or 6 times, because of him. Every time he used take us to Brindavan Gardens. And every trip used to be different. The trip from Bangalore to Mysore used to be the best though. I can still remember those yummy Maddur Vadas we used to eat on the way. Maddur is a small town enroute to Mysore and the place is famous for its vadas. Uncle B used to make sure he got us the hot ones, straight from the shop, though the halt was very short. The whole trip used to be very entertaining and fun. He was very fond of me, maybe because I was more verbal than my brother. He always used to say I have the best example in my parents and I should follow my Dad's path. I have always cherished those words. And I miss him so much now. I know he would've loved my family. He used to call me Valli ma, each statement would begin and end so. When I thought of making this rice, all I could remember was him and the memories of those days came rushing forth. This rice helped me pick up my bruised image on my flop biryani day. I was so involved in making that biryani, that I completely forgot to prepare something for myself. When I realised that I had to eat, I thought the simplest would help me save the day! As I said you can't get more simpler than this, but if you want to try a more spicy variety, try mixing the rice with the spiced curry powder, which has more additions to it. Else if you are in a need to fix a lunch in 5 mins, then this is for you, of course provided you have the cooked rice ready! Select good leaves and wash. Let it dry or you can pat them dry. These should not be wet as they don't get ground well. Heat a pan with 1 tsp ghee, roast the peppercorns, till they start smelling peppery. Then add the dried curry leaves and keep stirring them till they are crisp. Remove to a plate and let it cool. Grind this to a fine powder. Heat the pan again with ghee, add curry leaves, and broken cashew nuts. Roast them well and add this powder. Fry for 1 min, then add the rice to the pan and mix well. Rice should not be over cooked, if required you can spread them on a plate and let it cool. Mix well with the curry powder and add salt. Munching on a rice spiced up with curry leaves and nutty bits in between will surely give you a heaven taste! I added about 2 servings of Rice to 5 big twigs of curry leaves. It had perfect curry and peppery taste. I am sending this to Katie from Thyme for Cooking, who is hosting the Weekend Herb Blogging, an event started by Kalyn of Kalyn's Kitchen.